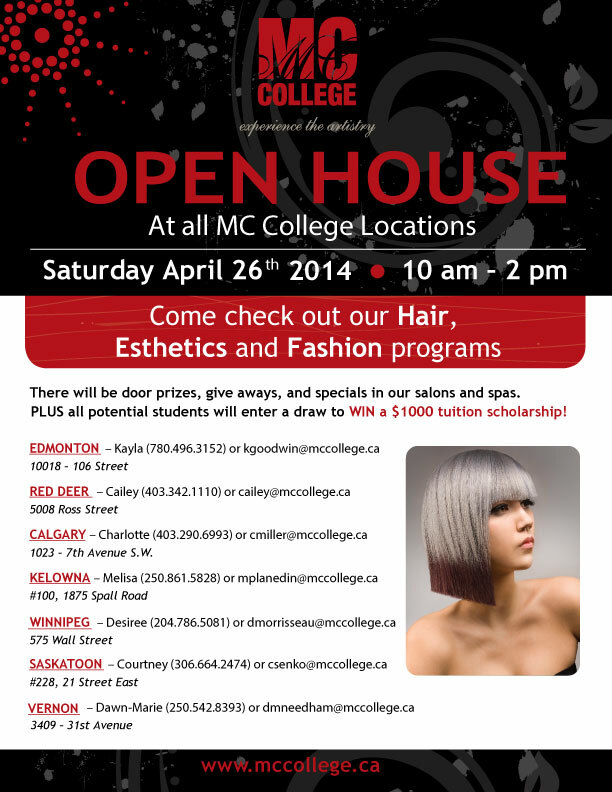 WIN A $1000 SCHOLARSHIP AT MC COLLEGE’S OPEN HOUSE! On April 26, we’re hosting an Open House between 10am to 2pm at all 7 campuses. Each campus will be giving away a $1000 tuition scholarship to MC College! Visit the event to learn about MC College’s Hairstyling, Esthetics and Fashion Design* programs, and experience the exciting student atmosphere. There will be campus tours, a photo booth, and complimentary snacks and beverages. At the photo booth, don’t forget to hashtag, #mccollege or #MCOpenHouse, to get your picture featured on our website! Current students will give mini manicures and hand massages, as well as showcase their work. Throughout the event, you’ll have the opportunity to watch and help MC College students prepare for an editorial photo shoot; from hair and make-up to wardrobe styling and camera work. Interested in hands-on work? Staff and Alumni will be having exclusive medi-spa, make-up and hairstyling demonstrations. MC College students will demonstrate hands-on training techniques in nail art and hair coloring. In Edmonton and Winnipeg, fashion design students and alumni will show you how to do fashion design sketches using Adobe Illustrator, pastels and water colors. RSVP online so we can help you make the most of your visit! Our Admissions Advisors are happy to answer any of your questions! If you are unable to make it to our Open House, you can contact us year-round to set up a campus tour with an Admissions Advisor.